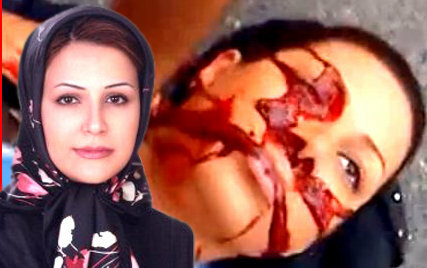 Footage of the death of Nedā Āghā-Soltān January 23, 1983 – June 20, 2009 drew international attention after she was killed during the 2009 Iranian election protests. Her death was captured on video by bystanders and broadcast over the Internet and the video became a rallying point for the opposition. It was described as "probably the most widely witnessed death in human history". On June 20, 2009, at around 6:30 p.m., Nedā Āghā-Soltān was sitting in her Peugeot 206 in traffic on Kārgar Avenue in the city of Tehran. She was accompanied by her music teacher, Hamid Panahi.The four were on their way to participate in the protests against the outcome of the 2009 Iranian presidential election. The car's air conditioner was not working well, so she stopped her car some distance from the main protests and got out on foot to escape the heat. She was standing and observing the sporadic protests in the area when she was shot in the chest. FOR NEDA reveals the true story of Neda Agha-Soltan, who became another tragic casualty of Iran's violent crackdown on post-election protests on June 20, 2009. Unlike many unknown victims, however, she instantly became an international symbol of the struggle: Within hours of Agha-Soltan's death, cell phone photographs of her blood-stained face were held aloft by crowds protesting in Tehran and across the world. With exclusive access to her family inside Iran, the documentary goes to the heart of who Neda was and what she stood for, illuminating the larger Iranian struggle for democratic freedoms through her powerful story. Directed by Antony Thomas.